The LBJ School 2019 Commencement Ceremony will be held on Saturday, May 25, at 11 a.m. in the Lady Bird Johnson Auditorium. Students will also have the opportunity to participate in the Office of Graduate Studies convocation ceremony and the university-wide commencement ceremony. Please note that you must have already graduated or be a spring or summer 2019 degree candidate to participate in this ceremony. EMPL students are also invited to participate in this ceremony. Fall 2018 degree candidates may participate in the spring 2019 ceremony. Friday May 24, 9 a.m., in SRH 3.124 — Mandatory rehearsal for all students participating in the May 25 LBJ School commencement ceremony. Friday May 24, 11 a.m. (immediately following rehearsal), Lady Bird Fountain. Dress code for the photo is business casual. Saturday, May 25, 11 a.m., Lady Bird Johnson Auditorium (Graduates gather in SRH 3.124/3.122 at 10 a.m.) —Students participating in the ceremony must arrive and check in at the LBJ School, SRH 3.124/3.122, no later than 10 a.m. Don't forget to bring your cap, gown and hood. Food, drink and alcohol are not permitted. Please don't bring any other items (purses, etc.) as there will be no place to safely store your belongings. NOTE: Hoods may only be worn by students who have completed all degree requirements for graduation. Following the ceremony, please join the dean on the plaza for a champagne celebration to honor the Class of 2019. At 7 p.m., the dean will lead a procession to the university-wide commencement ceremony, which begins at 8 p.m. If you are interested in participating in this part of the day, please let OSAA know and they can give you details. Academic regalia (cap and gown) are required for students participating in the ceremony. To order regalia and invitations and to review relevant deadlines, visit the University Co-Op. OSAA has a very limited number of caps and gowns to lend to students. These will be distributed to students on a first-come, first-served basis from Tuesday, April 23, through Friday, April 26, between the hours of 9 a.m. and 4 p.m. in OSAA (SRH 3.104). We do not have enough regalia for everyone, so please have a back-up plan. Students who borrow caps and gowns from OSAA must still purchase a hood and tassel. Students must pick up the gowns in person and are limited to one gown and one cap per person. If you would like to donate your cap and gown for students to use after you graduate, please drop them off in the OSAA offices after the graduation ceremonies. Seating is limited; all guests must have a ticket to enter the Lady Bird Johnson auditorium. OSAA will provide more information on the number of tickets each student can reserve soon. Please check your email frequently for ticketing details. All tickets must be picked up in person. We will not distribute to a proxy. Tickets must be picked up by 3 p.m. on Thursday, May 23. You must provide your UT EID and signature when picking up tickets. This program will be sold out. Please consider returning any unneeded tickets to the Dean's Office or sharing them with students you know who need additional tickets. Any unclaimed tickets after May 23 will be made available first-come, first-served at a Will Call table in front of the LBJ Auditorium beginning at 10 a.m. on Saturday, May 25. Questions? Please contact OSAA: lbjstudentaffairs@austin.utexas.edu. Backpacks, tote bags or any bag larger than 12 inches in dimension will not be allowed into any of the commencement venues. All bags are subject to search by security personnel, including purses, camera cases and diaper bags. Those with larger prohibited bags will be turned away. Do not bring any packages that cannot be opened or inspected. 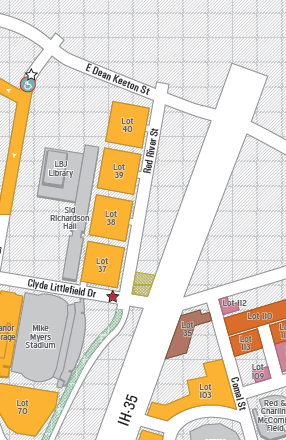 Limited parking is available for students and their family and friends in Lot 39; however, the LBJ School cannot guarantee parking for everyone. Visitors are encouraged to park in the Manor Garage (MAG), San Jacinto Garage (SJG), or any of the other seven university parking garages. Here are additional parking options. Special services, including sign-language interpretation, are available to accommodate the needs of individuals with disabilities at the LBJ School commencement ceremony. If you require special accommodations, please contact OSAA Monday through Friday between the hours of 8 a.m. and 5 p.m. at least five days prior to arrival at the commencement activities. The Graduate School hosts a university-wide convocation ceremony at Bass Concert Hall to honor master's and doctoral graduates. LBJ students can attend both the LBJ School and the Graduate School ceremonies. The Graduate School master's ceremony begins at 9 a.m. and the doctoral ceremony begins at noon. The Graduate School has master's students at the top of the marching order, so after you have crossed the stage, you will leave the building and return to the LBJ School for our ceremony. Doctoral students will be hooded during the LBJ ceremony. The university-wide commencement ceremony celebrates the cumulative accomplishments of graduates of The University of Texas at Austin, on the south mall of the UT Tower on the evening of Saturday, May 25. Check back for a schedule of student-led events. Check back for more information on the 2019 Class Gift.